My first experience with fried ice cream was at a Mexican restaurant, which my friends and I stopped at after seeing a movie one night. I was instantly intrigued by this contradictory dessert. Warm, crisp fried shell on the outside, cold, creamy ice cream on the inside; it was wonderful. 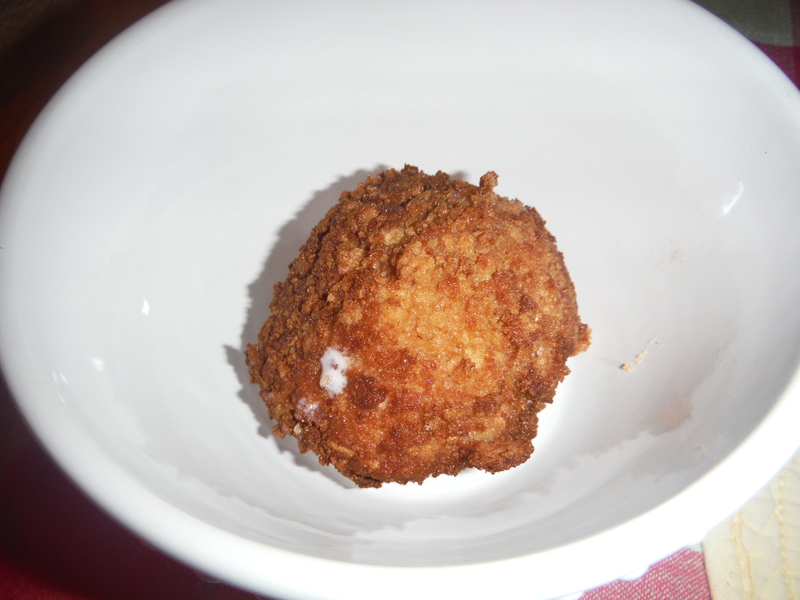 However, I realize some of you, Erik included, had a different first experience with fried ice cream. You first had it at a Japanese or other Asian restaurant, with a tempura based batter as the shell. So where did fried ice cream come from? No one can really seem to agree. Its origins go back further than one would originally think, with two fried ice cream origin stories placing its invention in America in the mid-1890s. In the 1960s it started being associated with Japanese cuisine, and then later becoming associated with Mexican fare in the 1980s. In the end, I don’t think it really matters that much where it came from…what’s important is that it’s delicious! Our inspiration for the recipe actually came from you, dear readers. Kind of. Someone found our blog by searching for “cinnamon toast crunch fried ice cream.” Of course at the time we didn’t have such a recipe yet. The thought of someone coming here and not finding what they were looking for is sad. Also, the thought of Cinnamon Toast Crunch fried ice cream is wonderful. So it was off to the kitchen to develop a recipe! Line a baking sheet with wax paper. Using a #6 or #8 scoop disher (ice cream scoop) portion the ice cream and place on the baking sheet. Put the packing sheet into the freezer and let the ice cream solidify for about an hour. 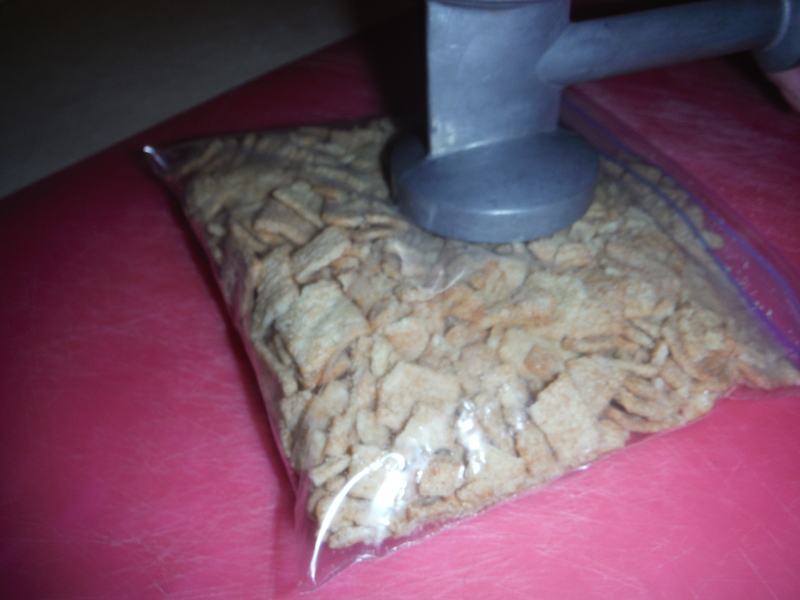 Pour the Cinnamon Toast Crunch and cinnamon sugar into a Ziploc bag, seal and crush well. You can either do this by hand or use a mallet. Crunch the Cinnamon Toast Crunch! 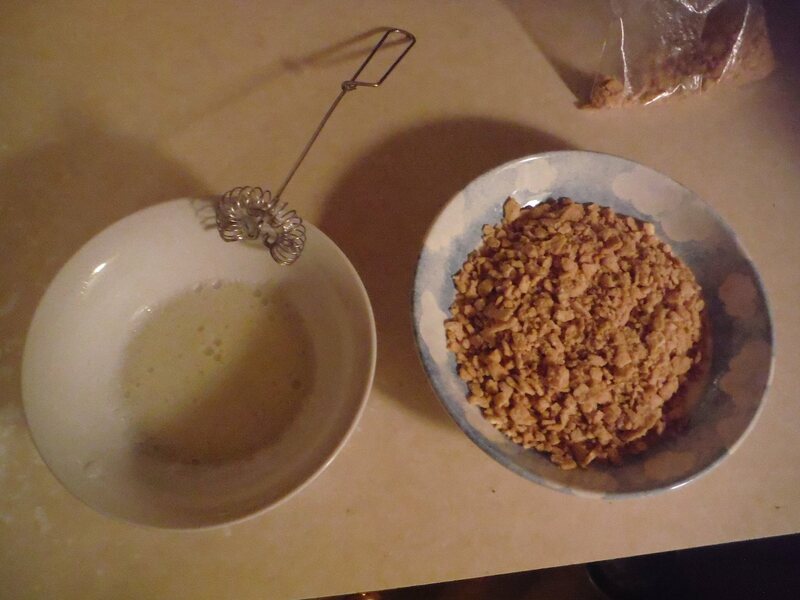 Before taking the ice cream balls out of the freezer, put the Cinnamon Toast Crunch crumbs in a bowl. In another bowl put the egg whites and whip them until they are frothy. Remove ice cream from freezer. 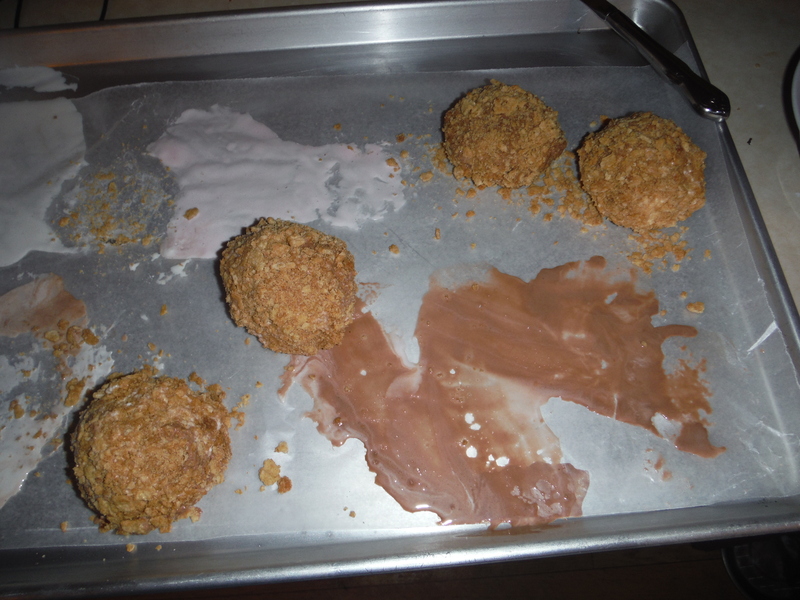 Working quickly, coat each ice cream ball in the egg white, then in the Cinnamon Toast Crunch crumbs. Pack them on to assure they stick. 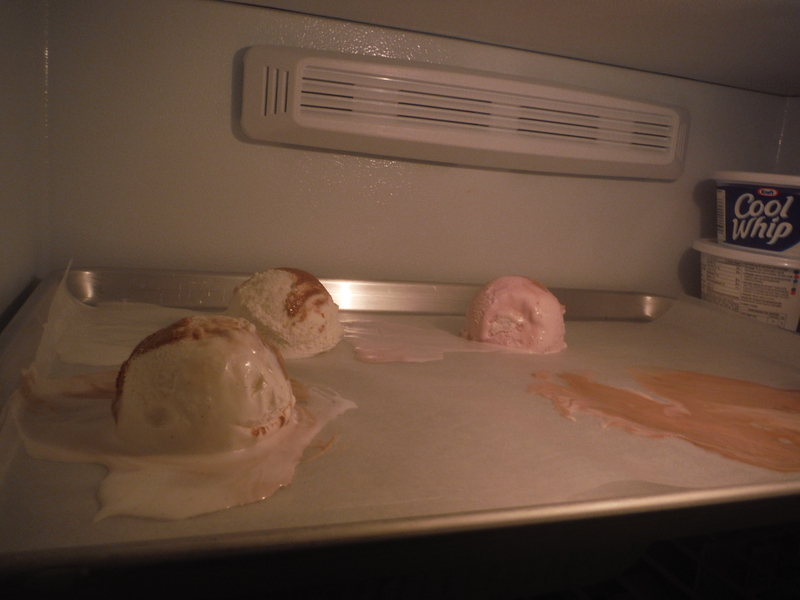 Return the ice cream balls to the baking sheet and put back in the freezer for 2 hours minimum. In a deep-sided pan or pot, add enough oil so that it goes up about 4 inches. Heat the oil to 375 degrees Fahrenheit. 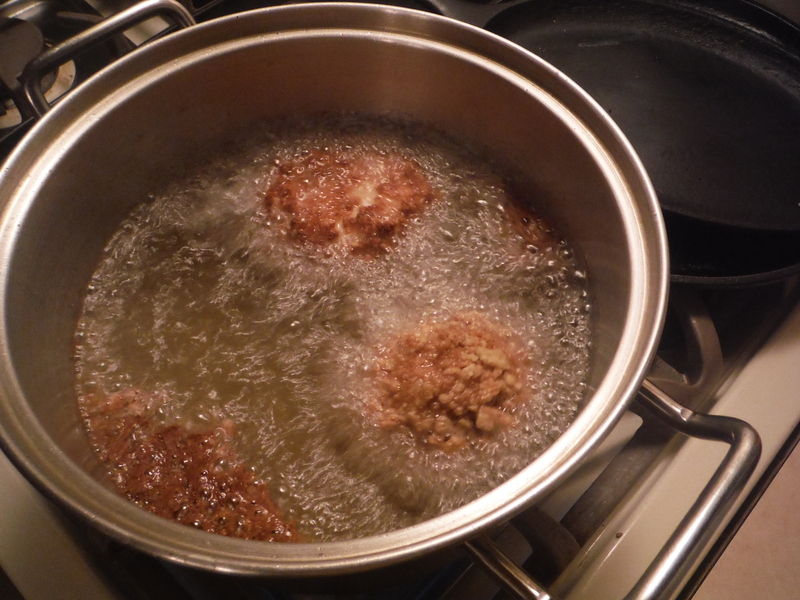 Add the ice cream balls to the oil, one or two at a time, and turn constantly, for 15-20 seconds until golden brown. Quickly pat dry with a paper towel and serve. Topping with whipped cream or drizzling with caramel sauce would be a nice touch. No time for picture! Gotta eat! If you don’t want to make all your fried ice cream at once, you can freeze them in individual bags for use at a later date. I’m not going to lie, there’s a lot of down time for this recipe, and if you’re only going to make a couple it uses a lot of oil. But it is a good special occasion recipe for if you’re having a party and want to do something special for dessert. It’s also yummy, and pretty cheap to make. Posted on August 8, 2014, in Etcetera and tagged cereal, cinnamon, crazy crossovers, dessert, easy, ice cream, recipes, summer, yummy. Bookmark the permalink. 1 Comment.